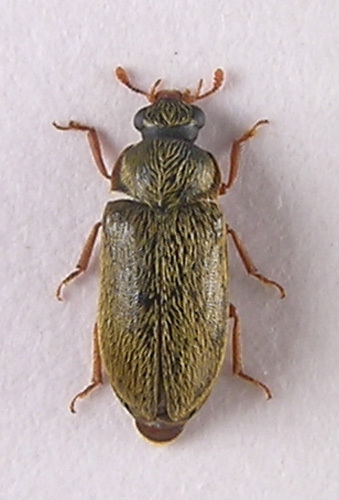 In the UK a small family of two species: Byturus ochraceus (Scriba, 1790) and Byturus tomentosus (De Geer, 1774). 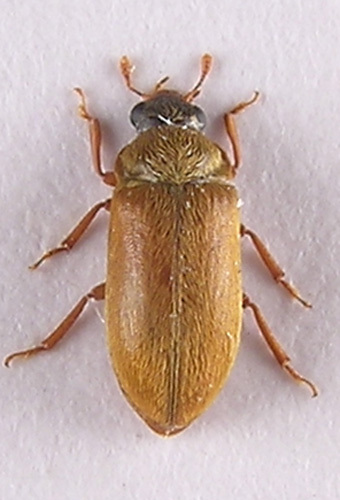 There has been some confusion in the literature over the years and a third species, B. urbanus (Lindemann, 1865) has been variously referred to, this is now considered conspecific with tomentosus. B. tomentosus is a notorious pest of cane fruits; Raspberry, Blackberry, Loganberry, Tayberry and other hybrids. Both species emerge from pupal cells in the soil during early spring and are commonly found in a variety of flowers, especially Ranunculus spp. and often in large numbers. Both may also be beaten from blossom, esp. Apple and Hawthorn. 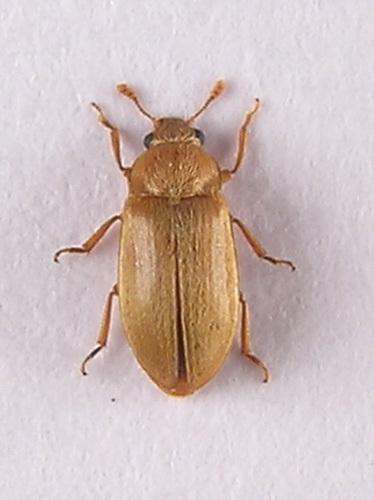 B.ochraceus is found through May into early June when they are seen in numbers on just about any flowers. Numbers decrease sharply in mid June and by July they are gone (Watford over 2006 and 2007). 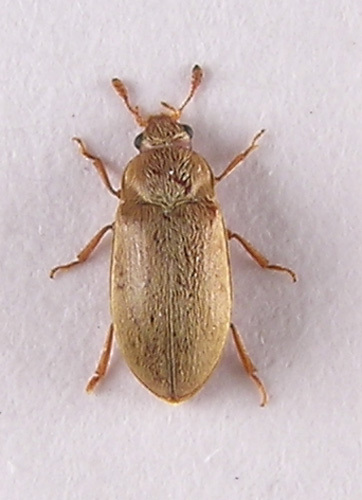 B.tomentosus (The Raspberry Beetle) is attracted to cane fruits as the leaves unfold in April, they feed along the midribs of young leaves causing characteristic eliptical holes. As the flower buds open the beetles begin feeding on the blossom. Eggs are laid from May to early July either on or near blossom buds or, if the buds have opened, in the centre of the flowers among the pistils or stamens. Larvae emerge within 12 days or so and enter the blossom or small fruit wher they will spend the next ten to twelve weeks feeding. Young larvae feed at the stalk end of the developing fruit but later move inside to feed on the central 'plug'. Affected fruit becomes dry at the base and turns grey/brown. The off-white larvae, up to 8mm. long, may be found within. Development is complete by late summer when they drop to the ground and burrow down to form a pupal cell. Winter is spent in the pupal stage. Both species occur abundantly throughout our Watford area. 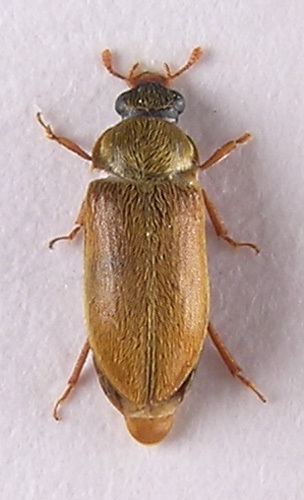 Byturus spp. are of very characteristic appearance and unlikely to be confused with any other family. 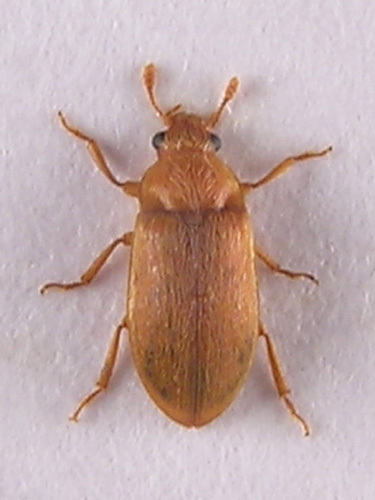 Small beetles, 3.2-5mm. tomentosus being on average smaller. Elongate, light or dark brown with appendages lighter and head darker. Mandibles sharp and usually prominent in set specimens. Antennae 11 segmented with a loose 3 segmented club, inserted in front of eyes. Joints 1 and 2 subequal in length, longer and broader than 3-6. Eyes large and prominent. Pronotum and elytra with dense golden brown backwardly recumbent pubesence. Pronotum transverse, more so in ochraceus, strongly convex with sides explanate, widely so at the hind angles. Hind margin straight. Sides smooth and rounded, sinuate before hind margin. Hind angles right angled. Elytra entire with well developed humeral prominence and side margins, without striae although the pubescence may lie in lines, esp. laterally, so giving the impression of striae. Tibiae without spines or teeth but with a small apical spur on the inside edge. Tarsi 5-5-5 first and fourth segment very small, 2 and 3 strongly lobed below, last segment as long as 1-4 together. Claws with large basal teeth. Care must be taken with the literature e.g. ochraceus (Scriba) is given in Joy as fumatus Fab. (sambuci Brit. Cat.) and by Vogt (in Freude) as aestivus (Lin.). Both Joy and Vogt use the name tomentosus (Fab.) for tomentosus (De Geer) in the Colepterist checklist. In tomentosus broadly explanate from the hind margin to the middle, beyond this it is very narrow when compared with ochraceus. In tomentosus widened towards the apex, in ochraceus more or less parallel. In tomentosus usually visible although very narrowly so for the whole length when viewed directly from above. In ochraceus usually only visible for a short distance behind the humeral prominence. 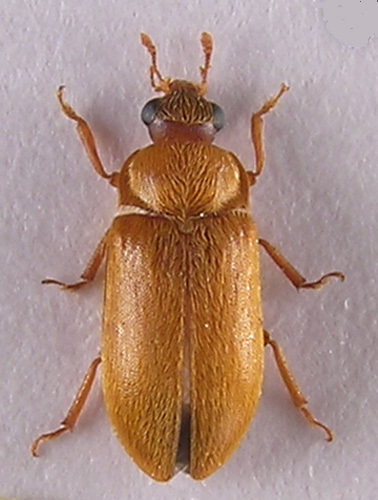 Tomentosus has smaller eyes. From directly above the head- this may require tilting a card mounted specimen back a little- measure the distance between the inside margin of the eyes, then divide this by the longitudinal diameter of the eye, the ratio is around 2.5. In ochraceus it is about 2 ¹. In tomentosus the adeagus is lanceolate, in ochraceus it is subapically constricted. 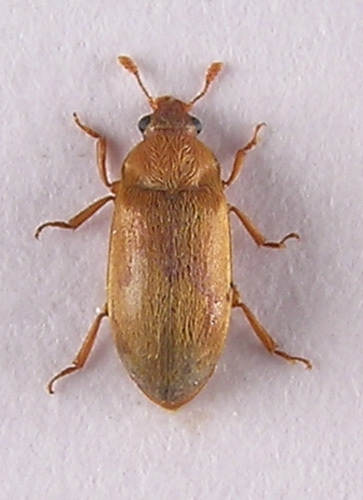 Both species are widespread throughout England, tomentosus extending further north into n.Scotland. Both occur commonly throughout the Watford area including town centre gardens and open spaces. Along the Grand Union canal by Cassiobury park and Common moor they were very abundant indeed during April and May 2007 on just about anything in flower. ¹ From Vogt, K Die Kafer Mitteleuropas Vol 7. p19. From our specimens an average of 25/10=2.5 (arbitrary units) for six tomentosus and 30/15=2 for eight ochraceus.